Home > Articles > Just How Bad are the Toronto Maple Leafs? Just How Bad are the Toronto Maple Leafs? A couple of months ago, I put together a post here briefly discussing the 2013 Buffalo Sabres — a team that the data, at the time, suggested would be one of the worst hockey teams in the Behind the Net era. This team was out-pacing a 2007 Atlanta Thrashers team that was widely regarded as the worst possession team assembled in the last seven or so years, and the competition wasn’t particularly close. The Buffalo Sabres in the last month or so have sort of tidied things up, and considering it correlates rather well with the firing of Ron Rolston and the hiring of Ted Nolan, one has to wonder whether or not the coaching change has trigged an immediate improvement — even if the bar was particularly low. The shot-differentials have been sliced, and although the roster is mostly devoid of hockey talent, they’re still playing a much-more competitive brand of hockey. On the other hand, the Toronto Maple Leafs — a team that was towing comparably-brutal shot-attempt differentials in the beginning of the year, but leaning on weak competition and insane goaltending to bail them out — has watched basically everything come apart at the seams. The goaltending’s still strong, of course, but they’re now running through the first of two scheduling gauntlets, and it has eviscerated thier underlying data. Let’s revisit that old, funny graph comparing the 2007 Atlanta Thrashers to the 2013 Toronto Maple Leafs and 2013 Buffalo Sabres. Below, the rolling shot-attempt differentials at even-strength (Corsi), our proxy for possession time and scoring chance differential. 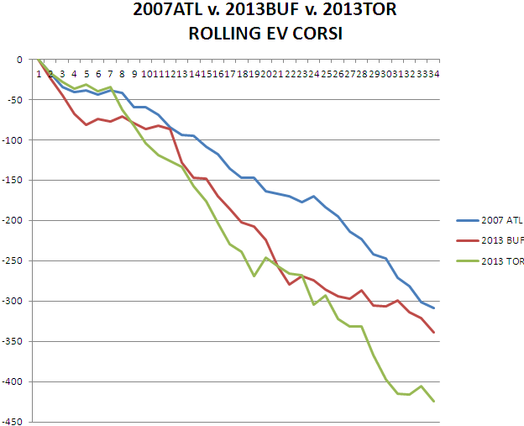 You’ll notice that Buffalo’s sort of in a flatlining period. Again, there’s a lot of stuff going on there that’s probably led to a bit of an uptick — I think Ted Nolan’s made a few systemic changes in the neutral zone to guard against teams from entering their zone each and every time with possession, something I observed during this week’s home and home against Ottawa. Either way, the team is, at the very least, not getting blown out of the water in games. This is good. On the other hand, Toronto. Regression has hit them as fast and painful, and unless you haven’t carefully followed how poor Toronto’s possession numbers were despite winning games early in the season, you likely knew this was coming. What’s really compounding stuff is that they’ve jumped up a notch or seven on the competition front. They’re playing teams that not only drill opponents on the shot-clock, but score a ton of goals (and don’t give very many up, either). And, Chicago comes into town on Saturday. What’s important to note between the two teams, though, is that pace plays a big role here. Toronto plays a much higher-event game, so their margins can run higher than Buffalo’s on a per-game basis. But, even with that noted, Buffalo’s back to pulling 44% Corsi at five-on-five, and 40.8% CorsiClose%. Toronto’s pulling 42.9% Corsi at five-on-five, and 42.9% CorsiClose%. So, in short: it’s actually much tougher than you’d think to differentiate between the two, even with Toronto’s observable hockey talent, and Buffalo’s mandate to continue stripping their roster of NHL-quality players in an effort to rebuild the ship through the draft. Toronto’s 5-on-5 Sh% has predictably nosedived (they’re down to 7.78%, which is right around the league median), but their 5-on-5 Sv% (.943, 1st in NHL) continues to buoy them from total implosion in the standings. What happens when that goes south?